...and that accessory is a capo. While there are plenty of cheap capos out there and they all basically work the same, the one I use is the G7th Performance capo. It's the only one I own, I've had it for years, and I use it regularly. It is specifically made for steel string guitar use, which of course electric guitar is. Its compact size and really good grip doesn't damage the neck whatsoever. I'm very happy with it, as are most owners. However, my main message here is not about which capo to own but rather just to have one regardless of how much you pay for it. You will be amazed at how different your guitar riffs and chords sound when you bump them up a few semitones. If, for example, you have a riff that is in open A and you place a capo on the 2nd fret so it now plays in open B, the whole character of your chords change. What I've found by doing this is that with the capo on the fretboard, you come up with new chords you would not ordinarily play in standard tuning. It is like they happen right out of thin air. It's incredible. There are a few downsides to capo usage. It's for chording and not soloing. 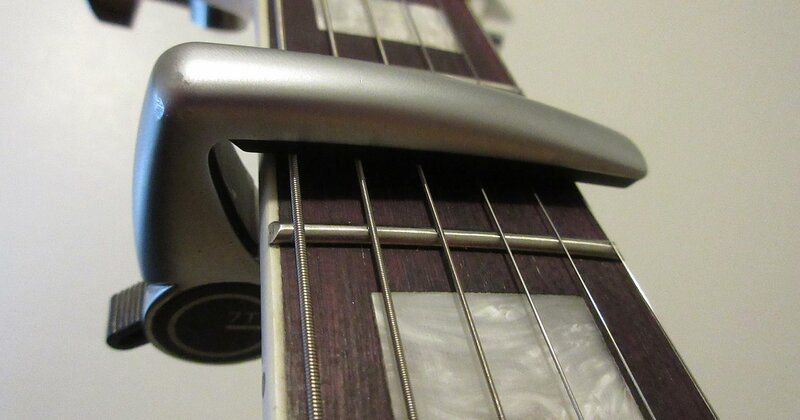 If you bend a string while the capo is on, it will almost certainly go out-of-tune instantly. You also have to sometimes "tune to the capo", meaning that what is in tune with open strings sometimes isn't with the capo on and requires a small retuning. The downsides are very minor inconveniences once you explore chords with the capo on. Something I will do sometimes is place the capo almost to the middle of the fretboard at the 6th or 7th fret so my guitar almost sounds like an electric 4-string mandolin with 2 extra strings. And that's just cool. Here I am with a capo on the 6th, it sounds awesome.